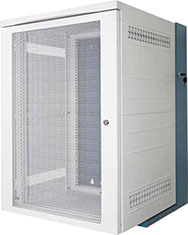 Our WallNet series of 19" wall mounted enclosures offer a sturdy and secure enclosure in a compact package. Ideal for remote installations of routers, switches, UPS and patch panels. Vendor neutral will accept any standard 19" mounted device. Integrated 19" mounting rails incorporated into adjustable inner frame for extra strength. Two cable entry slots on the top and bottom of the enclosure. Simple installation using template for locating mounting points on wall. Reversible door allows flexibility at installation site. Supports loads up to 120 kg, for standard wall box. Supports loads up to 35 kg, with extension kit. Expand the functionality of the WallNet with our extension kits. These kits, available in 140 mm depths provide both extra depth plus convenient access to the rear of the cabinet. The extension frame is first installed in the preferred location. The basic wall box is then installed using the lift off hinges, either left or right hand oriented. This convenient lift off hinge allows a single person to handle the installation. Depth Extension Kits: 140 mm. Height: 6, 9, 12 and 18U. Additional sizes available upon request. Dimensions conform to EIA-310E and IEC-60297-1, 2. Premium grade hot and cold rolled steel. Five stage iron-phosphate pretreatment with powder coat finish. Tested to 500 hours salt spray under ASTM-D610-01 and ASTM-B117. 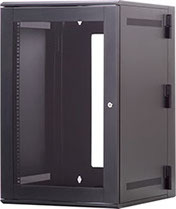 Our WallNet Series II premium 19” wall mounted enclosures offers a very robust and secure enclosure in a compact package. Ideal for remote installations of routers, switches, UPS and patch panels. We have focused on installer convenience and safety with our extension kits. These kits with 140 mm depth provides both extra depth plus convenient access to the rear of the cabinet. 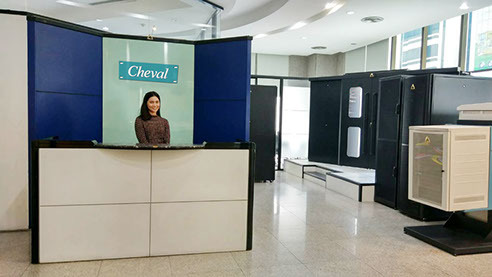 Our unique table design provides exceptional load bearing capacity and gives the user an excellent work platform when the enclosure is opened. 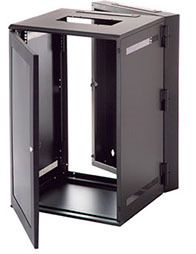 A safety stop arm prevents the enclosure from being extended beyond the support table. Color: Two tone white / blue low gloss textured powder coat finish. Depth main enclosure: 500 mm. Heights: 9, 12 and 18U. Additional sizes available upon request. Dimensions conform to EIA-310E and IEC-60297-1, -2. Designed and manufactured under ISO 9001:2008 and ISO 14001:2004. Five stage iron-phosphate pre-treatment with powder coat finish. Tested to 500 hours salt spray under ASTM-D610-01 and ASTM-B117.